EUR/USD recaptures 1.1400 as weak US yields weigh on the greenback. Markets continue digesting the Fed decision. The technical picture remains positive for the pair. EUR/USD is trading above 1.1400 once again, recovering from the lows it suffered after the Fed decision. Lower US yields weigh on the greenback at the wake of the European session. The Euro also enjoys the decision by the European Commission not to punish Italy, announced on Wednesday. Yet the shadow of the Fed and its mostly hawkish hike still dominates markets. The US central bank raised rates to a range of 2.25-2.50% as broadly expected. More importantly, the new dot-plot showed a projection of two hikes in 2019, a downgrade from three, but not close to what bond markets foresaw: only 50% chance of one hike. Moreover, the FOMC Statement was also upbeat. The Federal Reserve continues seeing risks as roughly balanced and the continues talking about “some further gradual rate hikes. Fed Chair Jerome Powell noted crosscurrents from weaker global growth but was quite upbeat about the US economy. Answering a question, he said that the Fed would continue shrinking its balance sheet as planned, a comment that sparked a sell-off in stocks. While the greenback is on the back foot today, the Fed’s hike cannot be described as dovish, and the dollar could still advance. Later in the day, the US publishes the Philly Fed Manufacturing Index and weekly jobless claims, low-tier indicators. A big bulk of data is due on Friday with final GDP, durable goods orders, and the Core PCE Price Index. 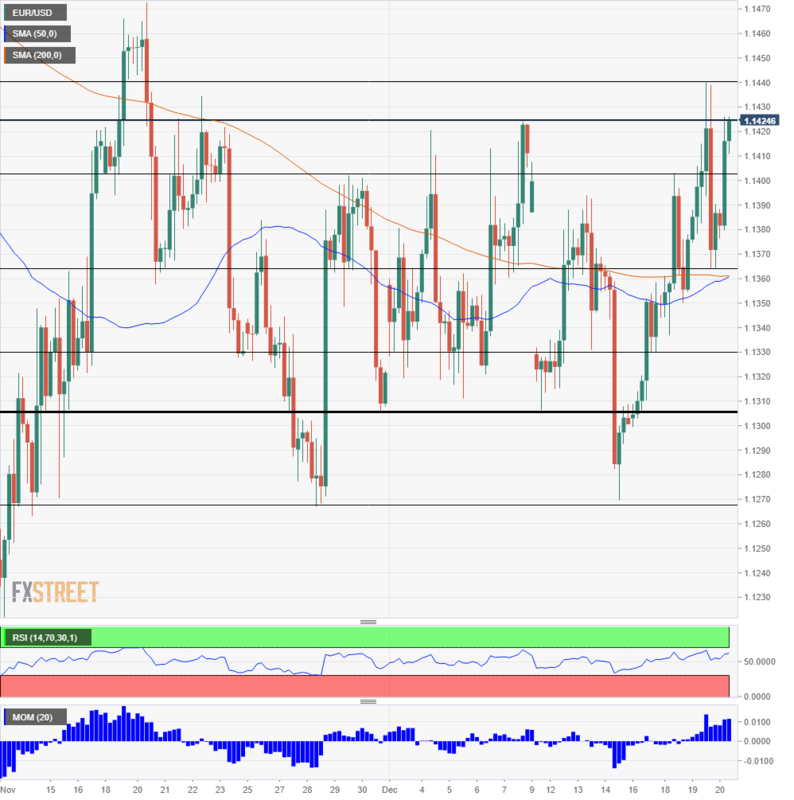 EUR/USD is trading at the upper end of the recent range and above the 50 and 200 Simple Moving Averages on the four-hour chart. Momentum is also positive, and the Relative Strength Index is rising but has not reached 70, thus still outside overbought conditions.